We’re accumulating couches here. I think you’ll understand why when you see the newest arrival. I mentioned wanting a striped settee before moving into this house, and Samantha spotted this antique striped sofa on Chairish for me. It was larger than I was planning for, but it was so perfect and I was afraid someone else would snap it up, so I bought it. Delivery took a few weeks, but it’s here now and it’s gorgeous. I’d like a pair of chairs in front of the curved windows, or maybe a round table for playing games, so the sofa won’t be staying where it is permanently. I’m not in a rush though — I’m looking forward to playing around with layouts and experimenting a bit. Oh hey, I potted my small fiddle leaf fig. The planter had a bird’s nest fern at the old house, but it didn’t survive the move. And that light! 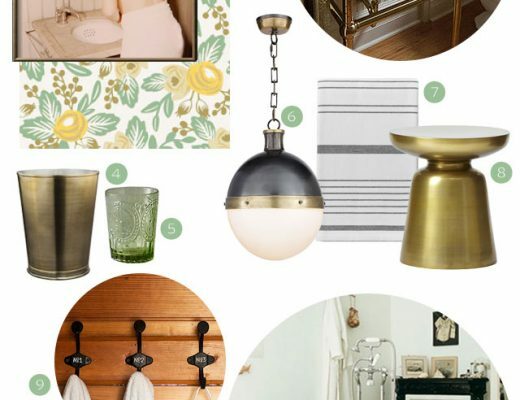 I’ve wanted that twin beacons brass lamp since I had pinned it and posted about it on the blog, two years ago. It was something like $800 at the time, so I skipped it, but then I spotted it on clearance all this time later for $250. I figured that was a fair price, and I was blown away by the quality of it when it arrived. It’s big! And heavy! And perfect! It reminds me of an insect (a praying mantis, maybe? ), but I tend to like that in lighting. This house, she is going to be good. 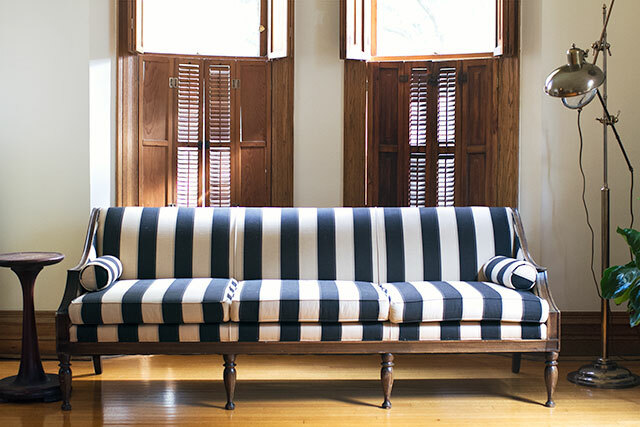 Wow….I never wanted a striped sofa. Until NOW! That is a beauty. Perfect lines, perfect stripes….gorgeous! Love the lamp too, love seeing everything start to come together! It’s taking a while, because like I said — I’m not rushing — but it’s coming together just as I’ve been hoping. This house is going to be so fun to work on! Love that settee! It definitely works for that space, but I can’t wait to see where it finds its forever home in your new space. Brandon and I would like to set up a library, either in that front parlor, or upstairs. That seems like a likely place for it to end up. That sofa is close to perfection! Could fit perfectly in a large hallway with dark walls and a large panting above. Love it! Love the striped couch! And like always, I can’t wait to see the finished space – you have a great eye! I think it’s awesome that people see things and think of me! I do that all the time with other people in mind too. And yeah, they must have only had a few left, or everyone scooped up the lamps when they went on sale. I just happened to see them, and I’m so glad I got one! I can see why it was so expensive. Ugh. Sooo much envy, for that lamp! 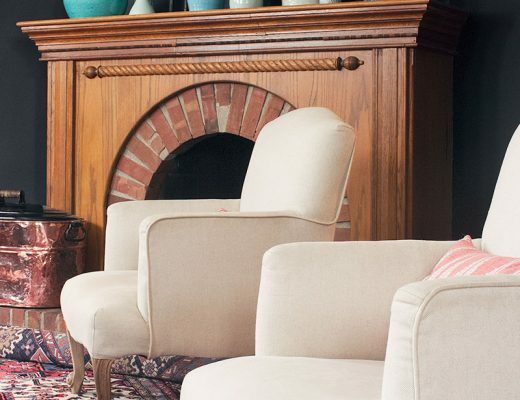 The vintage sofa is fabulous, but I have a question … is it comfortable? Did you worry about buying without sitting on it first? I’m in love with a West Elm sofa, but we don’t have a store where I live, and I’m terrified of ordering without a trial sitting first. So, can you tell me how you process any concerns you may have about buying a piece online? It is comfortable. Much more comfortable than I expected it to be, actually! This was a total leap of faith because I usually don’t buy something unless there’s a possibility to return it if it doesn’t work out, but I figured we could resell it if needed. At least with a store like West Elm, you can return things (but I imagine you’d be out some money for shipping to do so). Just curious – are you going to retain the wood window shutters or bring in fabric curtains or work a combination of the two? I know shutters are super expensive but wondering if you liked the esthetic of them. No plans right now for adding curtains. 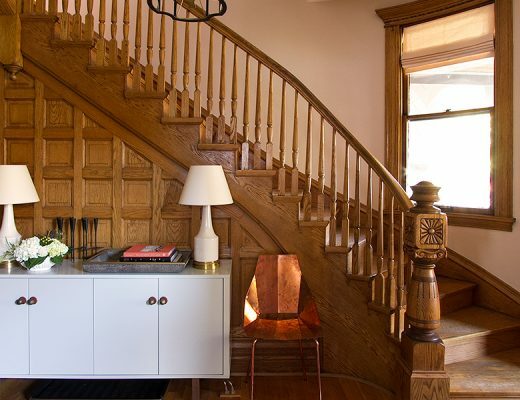 If I do them, I want to do them right, and the ceilings are so high that it will be pricey. I like the look of the wood shutters and trim, so I’m happy with them as they are. Yes, that striped couch is nice!!! 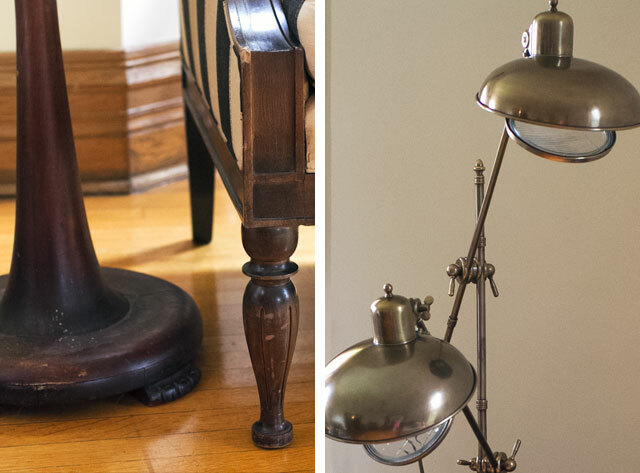 And, the lamp beside it — worth the $250. Yes, it is going to be beautiful in your house as is everything else you’ve shown. Ooh. I’m all stocked up on stripes now, but maybe someone else can grab them! I agree- this house is shaping up great! Love the new style! Not only do I like the sofa & lamp but I’m curious about the little round table on the end. I need to see a better picture of it & hear/read the story behind it. BTW…I love how you put things together. You could give Emily Henderson a run for her money. Aw, thanks. I like Emily’s style a lot. The little end table was a flea market find. It has feet! I love, love that sofa. I thought it was a magazine shoot / product catalog when I first saw the photo. Uber jealous!! LOVE the sofa!! I can’t wait to see what drapes you pair with it! The new sofa is great – I like how the legs of the new sofa are cousins to the legs of the other new sofa. Yeah, I like that they work together but aren’t perfect matches. Oh, that sofa is so perfect! Perfect choice! I love the couch. For some reason, when I saw it I instantly pictured it with the wood painted white! Maybe that wouldn’t work with you house – I think it’s the blue and white fabric that made me go there. It looks SO great! I’m glad you were able to swoop it up! Oh, I do remember reading that, but it slipped my mind in the comments above. Thanks for clearing the return process up! That couch is seriously insane. 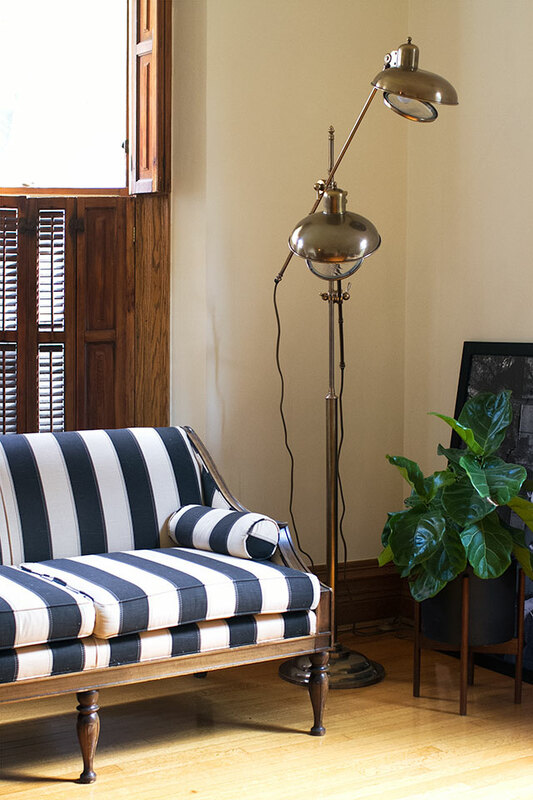 I have wanted a blue and white striped couch since…well, since forever. Color me jealous! That sofa is FANTASTIC – great pick up! Wow, Charish is so much fun! I spotted these lilac chairs: http://shop.chairish.com/products/lilac-velvet-vintage-chairs-a-pair. Such a pretty color–reminds me of your many blog posts about the perfect shade of pinkish-purple! Big fan of the sofa. Can’t wait to see how the room comes together.